I'm glad so many of you enjoyed the photos I posted from our trip up north last week! Goodness knows it was a beauty, that's for sure! If you don't mind, here are a few more photos. A little confession about our trip though. The day before we went, I had been to the doctor for sciatica and lower back spasms. Even though I was very uncomfortable, and just starting prednisone, I was determined to make the trip. About an hour after I took these photos I was in absolute agony and wondering how I would get home, the pain was so bad. While we were on the Kancamagus highway I called the doctor and she told me to take 4 ibuprofen, which I did. My husband hightailed it back to Rt 93 as quickly as possible and the whole 2 hour ride home I had to lie down in the back seat. It was a real bummer end to what was supposed to be a fabulous day. Remind me never to take Prednisone again. Hate, hate, hate that stuff and now I'm having withdrawal symptoms. This past Saturday we went to a local church in Portsmouth that sells all kinds of unique pumpkins. I like 'em white, striped, and wrinkly! They come at a cost though ... $28 for those three pumpkins! Holy cow! A photo from up by the Flume. Last night I had all my hair cut off, like Halle Berry's. Short I tell ya', but I like it. The display out by our front door. Soft and pretty. I hope Autumn is bringing cooler temps and brighter colors your way! lovely views, and I also like funky pumpkins, I like the mix near your door, very nice. Sorry about your sciatica, I can relate, had in past, no fun. Cute pic of you and hubby, sweet. I found out the height of your keyboard is very important for your back and wrists. I always enjoy your posts! Love the pictures! Still not a lot of color here - May not have much as it has been dry for a while here. Sorry your are dealing with sciatica issues. I have been there and still have flareups. So sorry to hear about your sciatic pain. That's the pits. You got some beautiful pics anyway. 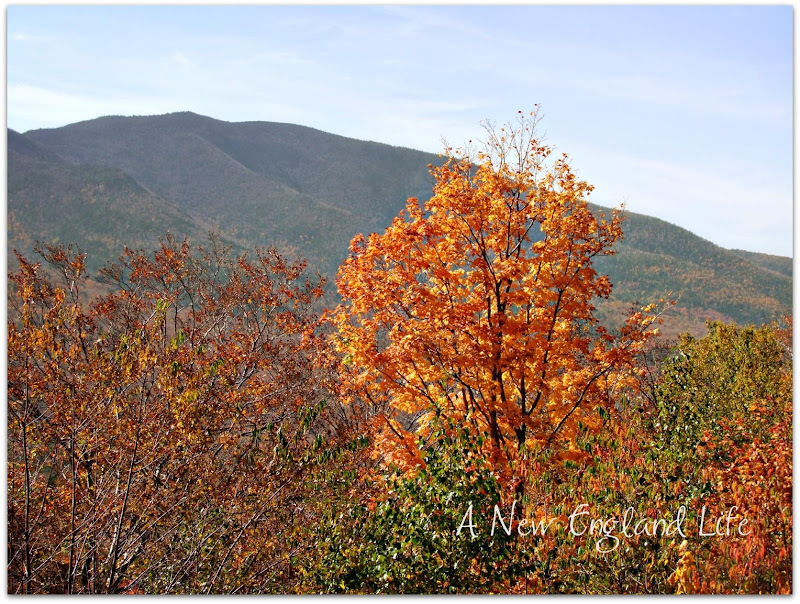 Autumn has been particularly beautiful up here above the white mountains as well. And the peak colors lasted a very long time but are almost gone now. Bare trees till snow. You sure can take a good picture while in severe pain! Back pain can be so difficult to deal with...I hope the PT is helping you. OMG - I feel your pain. Literally. My back went out on Friday and I could.not.move. I've never experienced pain like that. Apparently, my pelvis had slipped out of place. How does that happen...? Fortunately, my chiropractor was able to put everything back in order the following morning. My back is still achey and sore, but it's on the mend. I just cut my hair short, too! Must be the season. *smile* Mine is chin length though and allowed to go curly, it looks kind of retro. I like it and so does, The Frenchman. I've always loved Haley Barry's short haircut, but I've never had the nerve to go for it. Good for you! Nice short hair and beautiful fall colors! So sorry Sharon to hear you are in such pain. Pain always has a way of bringing us to our knees, but also I think it teaches us more precious lessons about life than anything else. Your pictures are stunning, as usual and it is so nice to see a picture of you and your husband. Feel better soon! I totally sympathize with you about your back. I suffer with sciatica also and the pain radiates in my knee. OUCH!!! Glad you got in some beautiful photos before the pain set in. I love the pumpkins you chose for your front steps. I hope you're feeling a bit better this morning! I injured my back at work last year and could hardly move for weeks. Therapy will help. It helped me. Your photos are stunning! Simply beautiful! 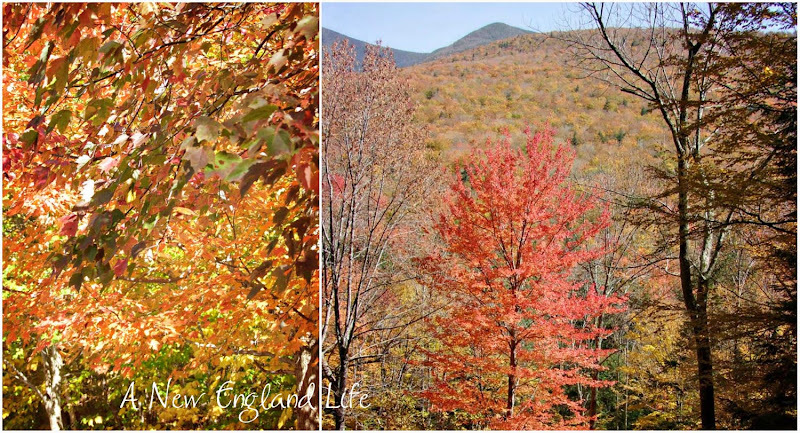 Thanks for sharing these lovely fall photos. We have nothing like that here in Florida (sigh) so I am thoroughly enjoying everyone else's fall colors! PS: Love the new 'do' BTW! I'm so sorry you're not feeling well! Hope you're soon on the mend! Thanks for sharing all this beauty with us, and the hair cut is adorable. Feel better soon! Love the photo's. Feel better real soon!! 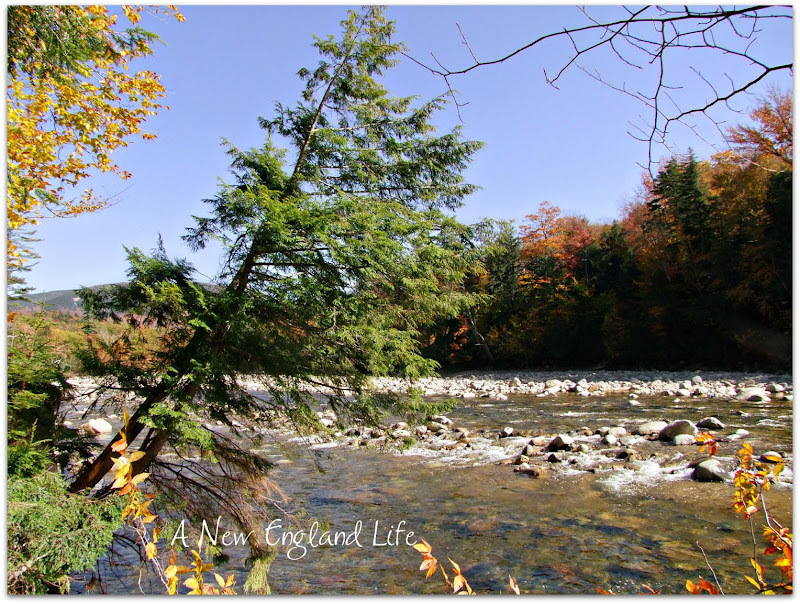 I always love looking at your blog, as we are moving to New England next year, and as always the pictures are beautiful. I can't wait to have a New England Fall! Hope you feel better soon. Since I won't be having fall in Arizona, I'm enjoying your beautiful pictures, Sharon! Love the one of you and your hubby! Frame it! Sorry to hear you were in so much agony with your back...hope you're doing much better. You took some fabulous photos, though! Love all the different pumpkins! 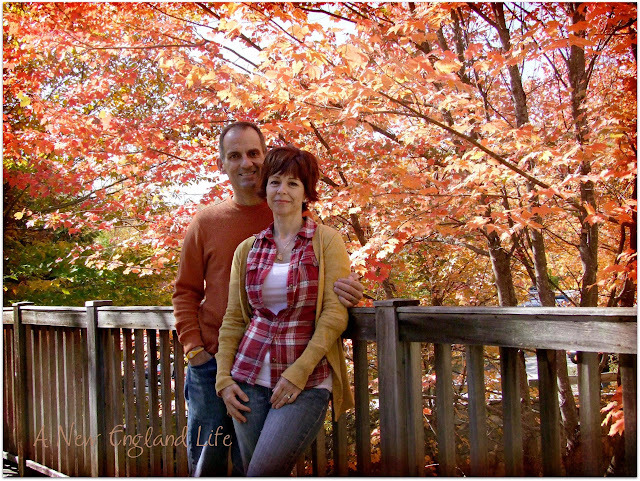 And the picture of you and your husband is great...what a backdrop with all those beautiful leaves! I hope your back is better. That sciatica pain is terrible! These are such pretty photos! Love the pumpkins! That's a great photo of you and your husband. Hi, nice photo of you and your husband. I haven't been to the Flume is such a long time. The pumpkins look wonderful. Um, Sharon? are you reading my mind from RI? hehe. I hate being on Prednisone. I am on 5mg now for my arthritis and hope to get off it asap, but nothing else stops the pain. I am sorry you have to deal with this! : ( But somehow you manage to get FAB photos anyway! a true photographer. was it busy on "the Kanc"? Also...I'm a huge fan of white pumpkins. In fact, I plan on picking up some small white gourds and flowers on Friday, maybe for some home decorating. Have a great rest of the week! Beautiful pictures, and your hair is gorgeous. Great pic of you and your husband. Was the prednisone dose not gradually reduced? I know all about sciatica! Unfortunately, can't take a lot of the typical medication used, so have to put up with it. On the plus side, it has made me as tough as old boots, lol. I do love the colors this time of year. It's getting a bit chilly now though. You managed to get some beautiful pictures despite your pain. I hope that gets all better soon! What a great picture of you and your husband, and the background couldn't be better! Hope the therapy really helps you! Pics are just gorgeous! 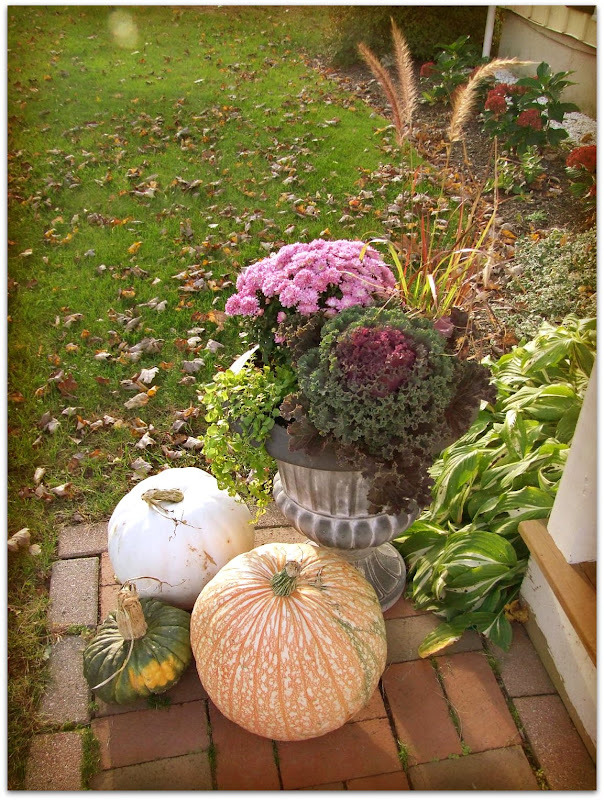 Love your fall display, the pumpkins are so pretty! We have cooler temps today and it feels wonderful! No humidity! Prednisone is a steroid, isn't it? Of course you're having withdrawal symptoms. So sorry to hear! Photos are beautiful and love the portrait of you and your husband. Your mums are lovely. Beautiful display! 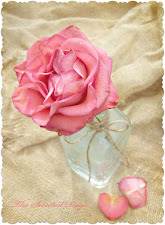 Loved these photos, Sharon and glad I found your blog again. I don't know what happened but I had an old address or something....thanks! Your hair is adorable. Sharon- your fall photos are spectacular- you truely had a wonderful trip as far as the foliage is concerned. I'm so sorry that you are having troubles- you know we all wish you start to feel better soon. Coming off Prednisone can be difficult for sure. Fingers crossed that this will soon be behind you. So sorry you are having back problems! Hope you are better soon! Sharon, I was in aww of the photos and what really did it was the one of the two of you. Beautiful. Just Beautiful. I too am sending so much energy your way . Feel better. Loved your blog. I cant seem to go with out visiting you and a few others. The fall color in New England is so fabulous. We once had a house in VT - a long time ago when our children were still at home. Good luck strengthening your back. I bet your hair looks darling Sharon. I love the photo of you and your man. The pictures are everything I think of when I think of New Enland in the Fall. Very cool funky pumpkins. Nice selection! So sorry to hear of your back issues and your not so happy trip. So sorry to hear about the back pain! I live with fibromyalgia, so I can definitely relate and understand. Glad P.T. is helping! The photos are gorgeous as always! The colours are gorgeous! So glad you are feeling better, and into physio now!! I love those wrinkly pumpkins!! HI! i found you through "Fresh" and soo glad I stopped by! 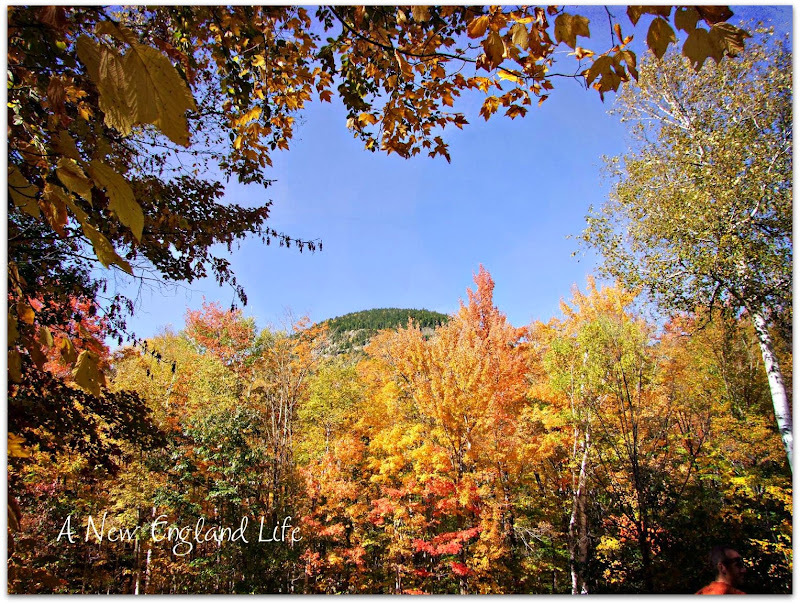 Love your photos, we just recently took a trip up to the White Mountains ourselves :) I didn't blog about it, but I posted the photos to Facebook. Sorry about your sciatica, this summer I had a bad bout with it, so I know just how you feel, It is an incredible pain to live with, I felt so helpless no being able do do.. anything.. hope you heal soon. I just found you via Stone Gable and read the most recent post, that you'll be leaving here. 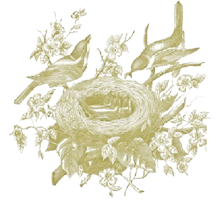 I will go over to your new blog but wanted to say hi and that I've enjoyed perusing this site and your lovely photography!